Posted on April 7, 2017 by Thomasina Fizdale / This entry was posted in Uncategorized. Bookmark the permalink. Looking to transcend your smoking ritual to the spiritual realm? Look no further. Introducing the crystal pipes, made from pure crystals mined from the Earth. These pipes are made from ancient crystals that are believed to contain healing properties. Harness the energies of the Earth and feel yourself heal when you smoke you favorite herb out of these beauties. 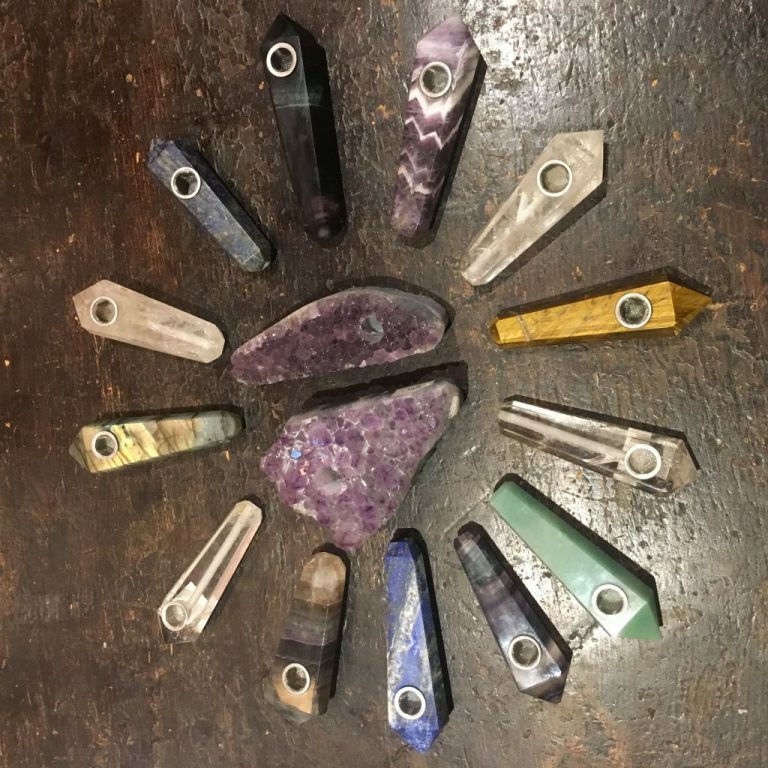 Our crystal pipes are available in a striking selection of Lapis Lazuli, Quartz, Purple Fluorite, Jade, Amethyst, Tigers Eye, and more. Read further to hear a little more about the various properties of some of these crystals. Fluorite, known as the “Genius Stone,” represents the highest state of mental achievement. It is known for boosting aptitude and discernment, the absorption of new information, and helping one work through complex issues. Harness the power of this crystal when making important decisions and working through problems. The fluorite’s energy stimulates and draws in more life force (prana) as it encourages both hemispheres of the brain to work harmoniously together in balance. It expands the consciousness and advances the mind to greater psychic awareness. Additionally, it stimulates creativity and provides an infinite range of avenues for exploration. Fluorite forms in many color variations, and each manifests its abilities in different ways, but all uplift the mental, physical, and spiritual levels of being. Lapis Lazuli has for millennia represented royalty, power, spirit, and vision. It is a universal symbol of wisdom and truth. Buddhists recommend Lapis as a stone to bring about inner peace and freedom from negative thoughts. A powerful crystal for activating the higher mind, Lapis Lazuli is an excellent stone for those wishing to stimulate wisdom and good judgment.